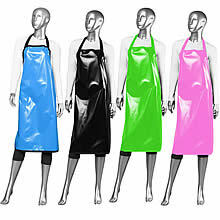 Professionals around the world has made this apron popular. Lower knee length (on average person) with bound edge trim, 2 long waist ties for back or front closure and adjustable neck strap with buckle. Made of Rip Stop waterproof fabric hair repellent and waterproof material. One size fits most. Smooth, durable and waterproof made of Rip Stop fabric.